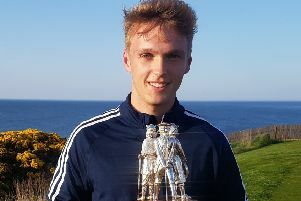 wHILE it would be nice to be proved wrong, hopes of the Helen Holm Trophy producing a Scottish winner at Troon over the next three days would appear to be slim. Based on handicaps alone, the home contingent look to have their work cut out in the SLGA’s flagship stroke-play event – its last staging before coming under the new unified umbrella for Scottish golf later in the year. Strom, is off +4.7, the best among the Scots, though handicaps alone, of course, are not always a reliable guide, is Gillian Paton, who plays off +1.1 at Royal Montrose. There have been only two Scottish successes in the event since 1992 – Lesley Nicholson doing the business in 1999 then Heather Stirling emulating her in 2002. Due to so many of our top players being at universities in the United States these days, it could be a while before there’s another tartan triumph. A dozen home players are missing due to the fact they still have commitments Stateside include Gemma Dryburgh, Scotland’s top-ranked amateur, and Connie Jaffrey, the Troon Ladies’ lass who thrilled the locals last year as she finished runner-up to England’s Annabel Dimmock. While Dimmock has since turned professional, Ireland’s Olivia Mehaffey is back to try to improve on her third place from 12 months ago, although whether she or anyone else can finish ahead of Strom remains to be seen. Believed to be the highest-ranked player to tee up in the event, she has played in two Junior Ryder Cups, including the one at Blairgowrie last year, and is a certainty to be in the Continent of Europe team to take for the Vagliano Trophy in June. Simply competing against her – as well as playing Royal Troon in Sunday’s final round after two circuits on Troon Portland – will be great experience for home players such as Gabrielle Macdonald, last year’s Scottish Women’s champion from Craigielaw, and Hannah McCook from Grantown-on-Spey.